The retail industry is experiencing significant upheaval. Online shopping is expanding rapidly, many national chains have closed locations and even declared bankruptcy, and malls are going dark in record numbers. Headlines have started calling this wave of closures a “historic tipping point” for American retail. However, almost all of the media reporting about these trends has focused on national retail chains. In order to find out how changes in the retail landscape are affecting independent businesses, we decided to ask them. Working with a coalition of national small business trade associations, we conducted a survey that gathered data from over 850 independent retailers across the country in a variety of retail categories. The survey found both bad and good news for independent retailers. 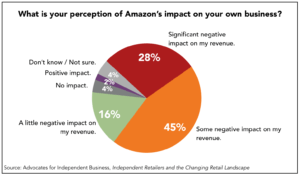 This finding lines up with previous results, such as a 2016 survey in which independent retailers described Amazon as by far the top challenge facing their business. Click on the graph to view at full size. In comments on this survey, many independent retailers report that they are innovating with their own online presence, but that it is increasingly difficult as Amazon becomes more dominant, including in product searches and in its data collection. “We have our own independent website… [but] the challenge [Amazon] presents to our presence online [is that] over 50% of all searches start on Amazon,” writes one bookstore in Wisconsin. Despite this challenge, a large share of locally owned businesses also report being better positioned than many national chains to withstand Amazon’s growth. 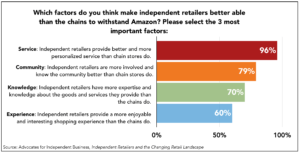 Two-thirds of independent retailers report that, despite their smaller size, they are responding to shifts in the retail industry as well as or better than competing national chains are, and a majority of survey respondents report that they see opportunity for independents in chain store closures. In the comments of the survey, one independent retailer in Minnesota gave an example of what that opportunity can look like: “A chain retailer closing in our community had a negative impact initially, looking abandoned and reducing foot traffic, but new local small businesses have used the opportunity and opened recently, with much support,” the business wrote. Newer retailers are even more bullish on the strength of independents relative to competing chains. Among those survey respondents who launched their businesses since 2012, more than half (52%) say that the growth of Amazon is hitting the chains harder than it is independent stores. For businesses who reported that independents are weathering the retail storm better than chains, we also asked them why. They cited independent businesses’ distinct attributes, and in particular, their personalized service, community involvement, and product expertise. The results of the survey are instructive for cities and towns. As many grapple with the implications of the changing retail landscape — including on local jobs and the local tax base — the results of this survey suggest that to foster a local economy that’s more resilient in the face of change, local governments would do well to invest in measures that strengthen locally owned businesses. As the retail landscape continues to change, this survey suggests, locally owned businesses will be increasingly critical to the economic future of communities everywhere. Download the press release with a summary of the report’s findings. The survey was done by Advocates for Independent Business (AIB), a coalition of trade associations and allied organizations that represent locally owned, independent businesses, and conducted by the Institute for Local Self-Reliance (ILSR) via email link to independent businesses in September 2017.